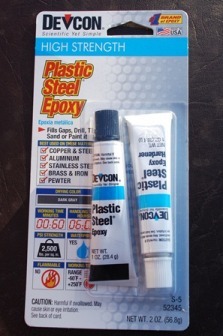 Epoxy: Two tubes you mix in equal parts. Higher temperature rating than most. All Hot Grips® must be installed with this epoxy, or an epoxy that is rated at a working or service temperature of at least 250 degrees F. This epoxy gives you a 90% chance of removing the grip intact if you purposely overheat the grip. The overheating process turns the epoxy punky and the grip can be twisted off intact for handlebar replacement or other need. 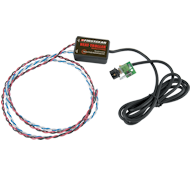 Fuse Holder: We recommend using the accessory fuse on your vehicle to power the Hot Grips®. If you do not have one, or it is in use, then we can provide you with this in-line accessory fuse. Switch Housing: Handlebar mounted switch holder for any model of Hot Grips®. Fits BOTH 7/8" and 1" handlebars - (shims included for 7/8" handlebars). Allen wrench and all stainless steel hardware included. This item is only the switch housing; our standard hi-off-lo toggle switch is included with every complete grip kit. If you need to purchase a toggle switch for another purpose see the Accessories page. It only fits our standard hi-off-lo toggle switch, and will not accept our Variable Heat Controller. Unmodified: Grips will either be close ended on the outer end, or have a stock 7/16" hole in the center. Flat Spacers: Ten flat polymer spacers that can be used to extend the handlebars if you select a grip length that is more than your stock grip. Not for Honda which have stepped spacers. Honda Spacers: Ten stepped spacers that can be used to extend the handlebars if you select a grip length that is more than your stock grip. Only used on Honda. Open Ends: If left unmodified (stock) then the grips will either have no hole, or a small centered hole at the end. Open End means we bore out the end of the grips to accept handlebar end-weights or end mirrors. For motorcycles we bore out the grips to handlebar diameter on the left grip, and throttle tube diameter on the right grip. For ATVs we bore out to handlebar diameter. © Copyright 1999-2012 Hot Grips® Mfg.. All rights reserved.